Asia – War Is It On Time? I cannot stress how serious things are in Asia all because the USA is now seen as impotent thanks to the debt. China and Japan, along with North and South Korean troops at the DMZ, are clearly on high alert. They are just one small incident away from letting the bullets fly. 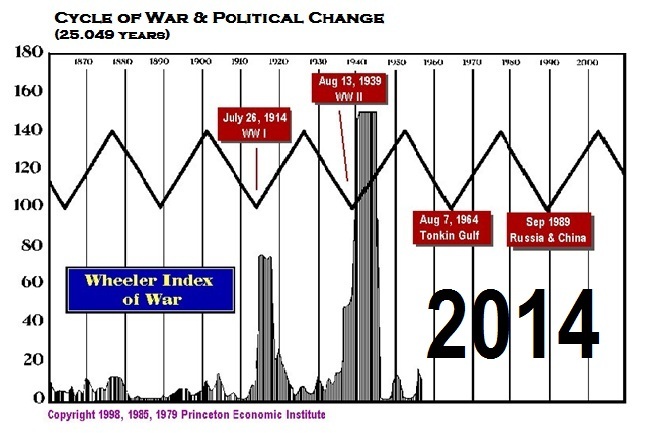 Armed combat and tensions are continuing to rise and this is in direct line with our models on War. Tensions are not likely to ease any time soon. The US assets are rising even as gold has floundered. This is largely what I have been saying, gold is the hedge against GOVERNMENT failure, not inflation. When gold has risen in time of war, it has done so ONLY as a hedge against that government. The primary assets are equities that provide a yield. We are also seeing 30 year mortgage rates tick below 4% – 3.999% actually. Grab that while you can and lock it in. This is one of the reasons why we are holding the Conference in Princeton now rather than later. With tensions rising in Asia & the German Elections in September, the fall may be too late. With the War Cycle turning up in a few months, this is getting very interesting.